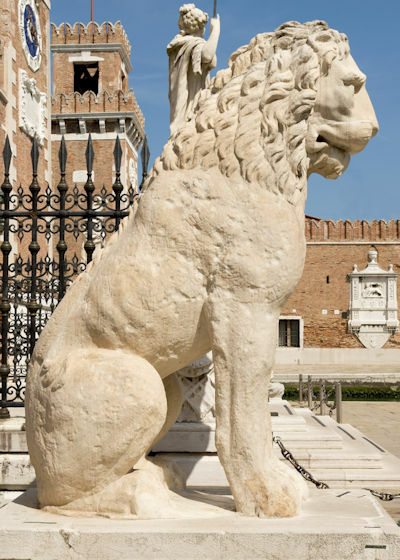 This white marble statue of a lion stands at the Arsenale in Venice. It originally stood at the Piraeus harbour near Athens, but in 1687 the two lions were transported to Venice by Francesco Morosini foillowing a successful campaign against the Ottoman Turks. People were aware of the fact that one of the lions had been defaced with strange marking across its shoulder. This was apparently some kind of writing, but it was not recognised as a runic inscription until it was seen by Johan David Åkerblad (died 1819). By this time parts of the inscription had eroded away, making interpretation very difficult. It was agreed that at some time in the eleventh century travelling Vikings had carved the inscription, but there was considerable dispute as to its exact meaning. a sun iuk runar þisar. The Swedes set this on the lion. gold he won in his travels. hewed them in an ornamental scroll. He won gold in his travels. 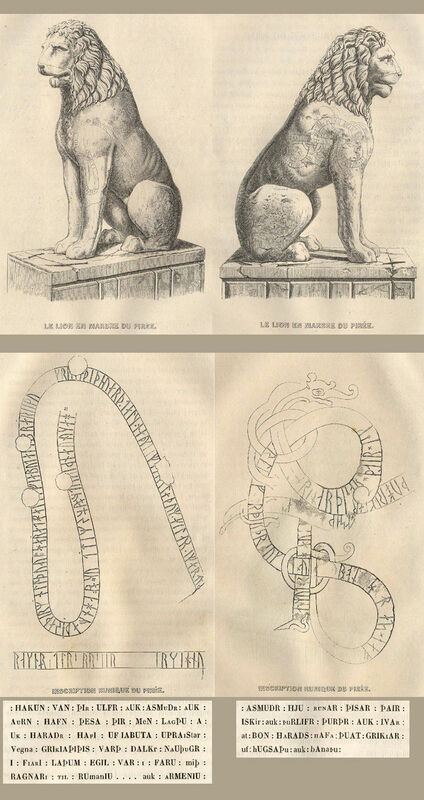 The runes are carved in the shape of an elaborate lindworm dragon-headed scroll, in much the same style as on runestones in Scandinavia. The carvers of the runes were almost certainly Varangians, Scandinavian mercenaries in the service of the Byzantine (Eastern Roman) Emperor. A rather shorter runic inscription from a travelling Viking, this time from a ninth century person called Halfdan, can be found carved into the marble parapet in Hagia Sophia in Istanbul.